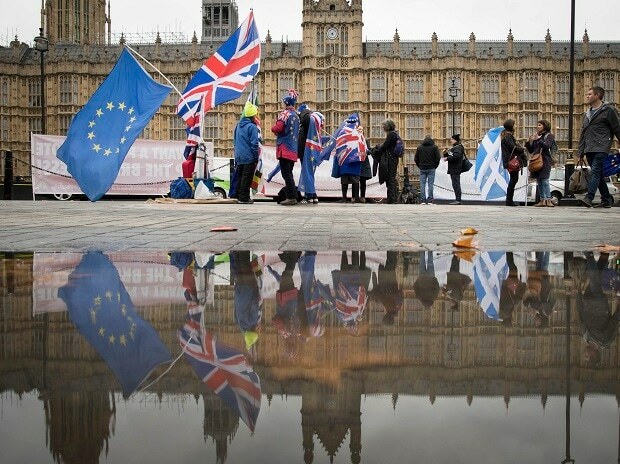 Many believe there’s an increased chance Britons will get to vote again in a national ballot on Brexit -- a repeat of the 2016 vote that triggered May’s rise to the helm in negotiating the U.K.’s exit. Below, lightly edited insights from market strategists, investors and analysts on what happens now. Near term this may mean higher volatility, higher uncertainty and therefore consistent with sterling, which fell earlier in the day, staying weak. Longer run, it increases the likelihood of a softer Brexit (via a new effort to find a cross party consensus) or no Brexit at all (via a second referendum) more than it increases the likelihood of a chaotic No Deal Brexit. In the interim, Brexit delay looks likely. This could even end up being positive for U.K. risk. Put differently, the probability distribution is shifting toward more of a barbell, in which both upside and downside ‘tail’ risks now command most of the probability mass, but in our view the upside tail (better than May deal from a market perspective) has increased more. Markets will be choppy in coming days but it’s worth remembering that nothing fundamental has changed overnight. The wisest thing for investors to do in the short term is nothing. If a deal can ultimately be agreed, we may see the Bank of England hike policy rates up to three times over the course of 2019. Conversely, if the U.K. does leave the EU without an agreement, I would expect the Bank’s Monetary Policy Committee to move rapidly to cut rates from their already-low levels. The resumption of monetary stimulus, in the form of quantitative easing would in my view, be a possibility.